S.W.C. ....Many windsurfing regulars are now in their 60's. It's accepted nowadays that age, given health and fitness from always having been highly active, is no longer a barrier to doing things. When you look back to old attitudes (even in parents, and especially grand parents times) of pomposity, and dignified rotund gentlemen slowly ambling along with walking sticks, while patronisingly patting little boys and girls on the head, we realise how thankful we should be at modern attitudes. Our generations are reaping the benefits, with full sporting lives. Gee fellas, I personally have found the advice in this thread to be amazingly helpful. Short, sweet, to the point, and with the lack of any personal boastfulness or bravado. Just remember, there are people in the world who have forgotten more about jibing than Iso ever knew. Ponder that on the Columbia swell. Most instructors focus on what you should do. I like to focus on what most poor jibers don’t do. #1 Front Foot Pressure: You should initiate your jibe by putting all the pressure you can muster into your front foot strap and not just onto the ball of your front food, you want to literally be trying to rip the front foot strap out of the board. Front foot pressure should be the constant throughout your jibe while back foot pressure should be used as a guide to tighten up the radius of the jibe at the end if need be. #2 Crouch down and really bend at the knees, it is super easy to get lazy with this, if you stand up straight you will kill the front foot pressure. Also keep the sail sheeted in the whole time (no need to do crazy laydown oversheeting) but keep the sail sheeted in it will get lighter and less powerful the further you get down wind. #3 Make sure it is in your mental checklist to slide your front hand all the way forward on the boom (towards the mast) just before you get ready to flip the sail. This will ensure the sail is able to flip cleanly, and not back towards the tail and the water. #4 SWITCH YOUR FEET BEFORE FLIPPING THE SAIL!!! (The lighter the wind the later the flip). Take your front foot out of the strap and aim for stepping that heal on the big toe of your back foot (miss slightly). Make sure to cross the centerline of the board as you bring your old front foot back to the big toe of your back foot. Crossing the centerline with your old front foot causes you to weight the inside (turning) rail and keep the board turning in the right direction. Make sure your new front foot goes all the way up to the mast base to help distribute your weight. Posted: Sat Jul 06, 2013 12:24 pm Post subject: Re: On Purpose? Don't blame it on BB, even in jest. Our WINDSURFING thread was derailed weeks ago by the Puffin Man's latest lie, "any technique or move or choice you can't do, you denigrate". I've seen video of you sailing. ....I had thought you were a better windsurfer than the video revealed you to be. 1. I will be attending more ABK clinics. There's so much to learn about windsurfing. I would think for someone who types about it as much as you, you would take some interest in learning. 2. You confused the jibe steps again in your last post. 3. Ah, the Gecko Loop! Of course you link to the video, and not the blog post that the video is taken from. The blog post that is entitled "The Silliest Freestyle Move of All Time? Who Cares, It's Fun!" The first line of which is "I know it looks stupid. But incredibly, it's a lot of fun!" 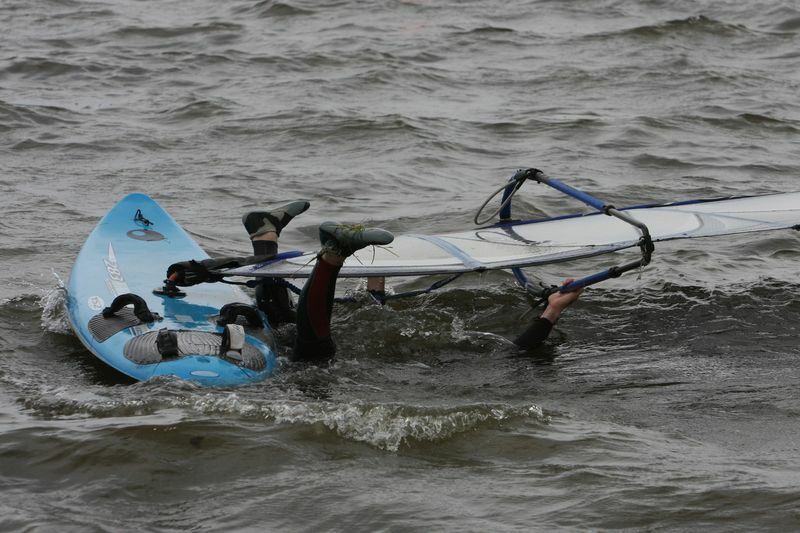 Readers of my blog knows that the themes are self deprecation and humor in the face of windsurfing's challenges. Also learning. Things that elude you utterly. Silly is my stock in trade. Hey PP, I've enjoyed reading your blog (http://www.peconicpuffin.com) over the years. Your posts are not only informative but written with style and a good sense of humor. It's too bad so many of these iWindsurf threads are polluted by Iso's hate-filled language. Thanks for the kind words, Mo! I agree with coyote about the Peconic Puffin. Michael's posts are informative and funny. In fact, my morning routine in the summer is to eat a bowl of multigrain Puffin cereal (with blueberries) and read the latest Peconic Puffin post. Its even better when I am out in Peconia!! I only get disappointed when there isn't a new post. oh well, I guess Michael can't do it every day. Thanks again for sharing the stoke, Michael! !